Abandoned house in the prairies of Howard, South Dakota, United States. Ghost houses – are homes that were abandoned by its previous owners. Each of them has its own unfortunate and heartbroken story: illnesses, death, accidents. The story of abandoned homes that ended with even more dramatical results – the destruction and devastation. Also if those ghost houses look horrible, any of them will become a perfect filming location for any scary movie. After they have been left, they have rebounded into something magical, monstrous, wild and still magnificent and attractive at the same time. Especially those abandoned ghost homes have been magically attracting tourists, photographers as well as new bloggers and Instagrammers, spreading the word about those households with a speed of light. Turning those abandoned places into the main tourist attractions of every region. These godforsaken houses are looking sad enough, but they represent a very picturesque and mysterious sight. 1. The tree sprouts through the ancient ruins in Wales. 2. Abandoned house in the prairies of Howard, South Dakota, United States. Howard, South Dakota, United States. 3. New York, United States. An abandoned house on the island of North-Brother. In 1885, the island was used as a reserve for the people with symptoms of smallpox and typhoid. Later it was converted into a rehabilitation center and a prison. In 1963 this place became totally empty. 4. Florida, United States. Beautiful, tiny abandoned house, built in a Victorian style. 6. Maryland, USA. The flood led to the fact that the bulk of the Dutch island in the Chesapeake Bay sinks under the water. This abandoned house is a favorite location of birds and is the last reminder that people lived here only in the previous century. 7. Canada. The abandoned house has been hiding in the dense vegetation of beautiful Vancouver Island. It looks like they need a proper garage door replacement. 8. Iceland. The real hobbit hut! Very sad that it was long abandoned by its inhabitants very long time ago. 9. New York, USA. 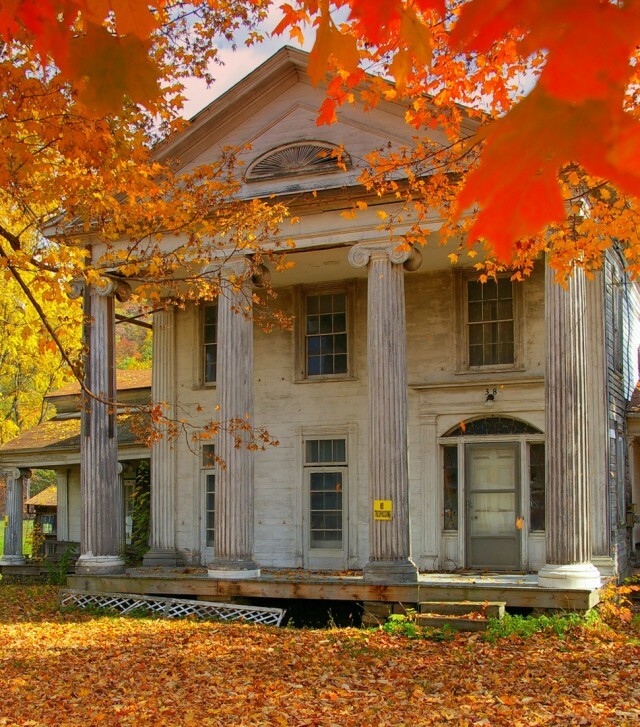 An abandoned house in Seneca Lake, New York. The area around the house is now used as a cemetery for vintage cars. Those picturesque car skeletons are scattered around the collapsing ghost house. 10. Taiwan. These Sanzhi UFO houses were intended for sale to the US servicemen. The construction of those homes began in 1978, but two years later the work was stopped due to the lack of investment. 11. Carter Ferry, Montana, USA. A lonely house in the middle of tremendous uncertainty. 12. Buffalo, New York. Whenever a person has left a place, nature takes her right to the property. 13. Björk, district of Romsdal, Norway. A stunning building stands against the background of a desolate Norwegian landscape. Björk, district of Romsdal, Norway. 14. Florida, USA. The mansion “American Versailles” could become the largest one in the entire America. Its construction was stopped after the financial crisis in 2009. Mansion “American Versailles” in Florida, USA. 15. Riverhead, New York, United States. Riverhead, New York, United States. Who Are The Crypto Kings? 10 Best Casinos in the World!